Deepika Padukone used to be a model. That explains the long legs. Or maybe the length of the hind limbs explains the job profile she's adopted. But when you become a brand ambassador for a scooter for ladies and are yourself a foot and half taller (in heels or otherwise) than the average Indian woman, it's a problem. Like the scooter you endorse reaching your knees at best in height terms at the launch event. Or having to sit practically in the pillion seat for the ads. Fortunately the Yamaha Ray showed immense multi-gender promise at its first ride and it is here today challenging the current king of the scooters, the Suzuki Swish for the crown. On the other side wearing shiny orange togs is the new Mahindra Rodeo RZ, which received new paint and an engine remap recently and failed to make our delicious track test. The Rodeo has up its sleeve a rather nice 125cc engine that matches the Swish in displacement and this battle has been brewing as well. Today we search for a scooter that can take on the sparkling performance, the easy, assured handling and the very nice price of the Swish. For perspective's sake, the launch of the Ray means that all Indian manufacturers, save for the CBU phenoms, now offer scooters except Royal Enfield, Harley-Davidson, Hyosung and Bajaj. The first three will probably never offer one, but with scooters headed surely to the 50 per cent mark in sales volumes for two-wheelers in India, it begs the question how long Bajaj will stick to its motorcycles-only guns. Now back to our trio, then. If I were more cynical, or just wore dark enough sunglasses, I'd say you couldn't tell any of the Indian scooters (one certain overpriced Italian scooter aside) apart on design from ten feet away on a clear summer afternoon. And to be honest, our lap footage from the go-kart track was ample evidence. We had a hard time telling apart the three blue scooters that were in that test, despite full HD footage and a 27 inch iMac being employed to that end. What I mean is that Swish may be our best scooter as we enter this test, but its styling could have been more distinctive. It looks sleek and sharp but the issue is that so does almost every other plastic-bodied scooter in the market. Build and finish levels, fortunately, are excellent. The Rodeo RZ may wear new paint but its styling approaches sharp but isn't. The orange our test bike (our longtermer to be exact) wears already appears to be fading though it is actually the light falling on the metallic paint that causes the illusion more than this being a paint or pigment related issue. But the problem is that the Rodeo just doesn't look sharp enough and while finish levels are par for the segment, build quality feels a notch lower overall and given how close this segment is in quality terms that minor difference can be make or break. The Yamaha Ray then, is terrible. But before you fall off your chair, I specifically mean this silly maroon colour we received. In the other colours, yes, including that de riguer pink, the Ray looks much more distinctive in the flesh than in the pics and there is a subtle aggression in the lines that in my book make it properly masculine. If I were in the scooter market right now, I would consider the Ray in blue, Deepika's assertions notwithstanding. The Ray's weak spot though is the black plastic panels which seem better than the Rodeo's plastics but aren't able to match the Swish. Finish levels too can improve across the board. The Swish then, is our pick here by a hair. The Ray would win if it had better build and finish but as it stands, what the Suzuki lacks in distinctiion it makes up for with excellent plastics and solid build quality. The Yamaha Ray is at a slight disadvantage when it comes to engines because is displaces just over 10cc less than both of the other scooters. But it isn't automatically the third scooter here. The Rodeo RZ is a surprise because it uses its 4kg weight advantage over the Swish to full effect, managing a 9.7 second run to 60kmph, 0.9 seconds quicker than the Swish. The Ray, to its credit, turns its 6kg weight advantage over the Swish into a 60kmph time is just 0.15 seconds slower than the Swish. All the three scooters hit the mid-80s in top speed terms and all extremely quiet at street speeds and a little bit more vocal when maxxed out. But Mahindra never harped about the Rodeo's performance. The economy was supposed to be superb. In our tests, the Rodeo doesn't actually deliver. It's in ballpark, but it isn't leading. The Rodeo manages 45.6kmpl in the city and 56.2 on the highway. The Swish beats this with 56.3kmpl on city roads followed by an impressive 58.8kmpl on the highway. The Ray at 45.74kmpl has the measure of the Rodeo in the city and nearly matches the Swish on the highway with 57.75kmpl to boot. But what separates the trio for me is the feel of the engine. The Rodeo engine, despite its performance, feels more stressed out maxxed out than the Swish and both of the other scooters feel happier mechanically ridden hard. Overall, the Ray impresses with its turn of performance and economy, but the battle for the powertrain victory is between the Swish and the Rodeo. I'm tempted to hand the points to the Mahindra here for the engine performance, but the Swish responds with excellent economy and a far more mechanical equanimity under duress for me to overlook. I'm going to say the Rodeo may be quicker, but the Swish is better overall just by a hair. Ride quality, for me, is the big differentiator between motorcycles and scooters today. The smaller wheels and the smaller travel in the suspension mean that scooters cannot touch motorcycles when it comes to bad roads in comfort terms. That said, even within the scooters, those that favour the trailing link format, say Activa, are a distinct notch behind those that use telescopic forks. And all three here have them. The Rodeo, to begin with the Mahindra, is a decent scooter in terms of dynamics. It goes around corners well enough and manages to absorb roads neatly as well. But the problem is that there are scooters here that do both of those things better. The Swish, for example, feels sharper to corner and a little bit more composed over really bad roads which give it the edge. The Ray on the other hand, feels the least top heavy of all of the Indian scooters and is quite a laugh in the corners. It feels secure and planted leaned all the over even when you are scraping bits and its ride feels stiff relatively speaking but it manages bad roads quite well. The braking on all three is pretty good, as is with all of the Indian scooters more or less. The lack of anti-dive thanks to the telescopic forks makes all three far better tools in full panic mode where a trailing link would go into anti-dive and resist the weight transfer eventually locking the front wheel. The Ray and the Swish are clearly ahead here and the Ray has the edge in dynamics. 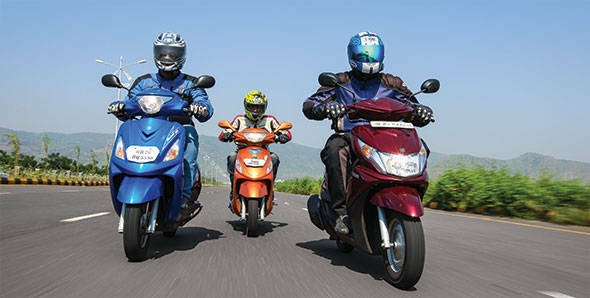 Its lower weight, good quality rubber and predictable chassis behaviour make it the scooter to beat in dynamics terms. In terms of features, all three are evenly matched. The Rs 56,400 on-road Mumbai Rodeo has the maximum space under the seat but neither the Mahindra nor the Yamaha have rear brake locks. The Yamaha feels the sportiest to ride but also has the smallest floorboard of the three. But despite being loaded to the gills with the features, the build quality, the feel of the powertrain at full chat, the lowest economy figures here and the styling slot the Rodeo RZ third in this comparison. The Yamaha Ray is a bit of a surprise. I wasn't expecting it to overcome its displacement and consequent performance disadvantage but the Yamaha manages to do just that with its styling, its economy and very good engine performance - it's solidly quicker than every other scooter in the market, including for example, the Vespa. It is also priced rather well, coming to Rs 54,999 on-road Mumbai, a good Rs 2,000 below both of the other scooters here. And amongst the lowest priced scooters in the market today (think Honda Dio and TVS Wego). Which brings us back to the Suzuki Swish. It has the twin trump cards of excellent, torquey engine performance and the best economy in class, apart from a large footboard, excellent plastics, great build and a sense of eagerness and fun about it that only the Yamaha matches. Which means the Rs 57,000 on-road Mumbai Swish's lead in the scooter segment may have been whittled down to next to nothing, but it's still ahead.